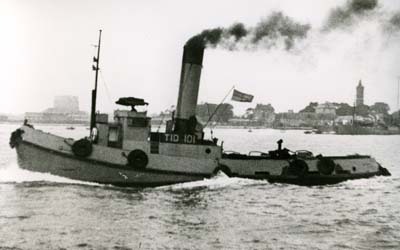 TID 1 to TID 151 were built by Richard Dunston Ltd., Thorne. TIDs 50, 51, 56, 57, 62, 63, 127, and 128 were assembled at Thorne but completed at Hessle. TIDs 9, 61, 65, 82, 84, 86, 90, 91, 92, 93, 94, 95, and 96 were assembled at Thorne and completed by C.D.Holmes, of Hull. TIDs 30 to 47 were assembled and completed at Hessle. Launched by Pat Dunston, wife of the Chairman. Engine number 915 by John Dickinson of Sunderland. Boiler number 3715 by Alex Anderson (Motherwell) Ltd.
19.3.1943: Handed over to Ministry of War Transport. Naval work to 1945: (M.O.W.T.). 10.1946: Sold to Government of Finland. 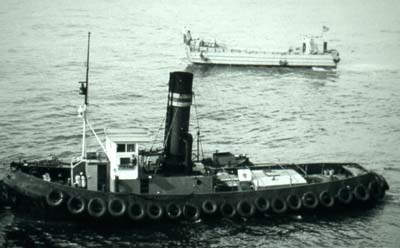 This vessel was delivered to Finland as part of a convoy of eight TID tugs. 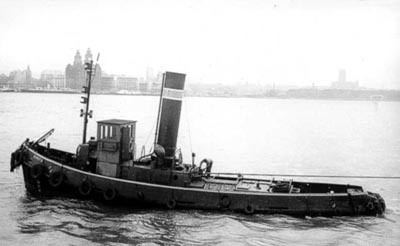 9.10.1946: Sailed from River Mersey to Swansea. 29.10.1946: Arrived Dartmouth from Swansea, in convoy with TID Nos. 7, 25, 30, 35, 40, 41 and 74. 6.11.1946: Arrived Rotterdam, via Dover. 22.11.1946: Passed through Kiel Canal, bound for Helsinki. 14.1.1947: to Metsäliitto Oy, to be repaired by Linnan Telakka Oy, Turku. 2.5.1947: Metsäliitto Oy, Helsinki, renamed METSÄLIITTO 1. 12.8.1948: to Ab Kaukas Fabrik, Lauritsala, renamed TARMO. 1954: owners name styled Oy Kaukas Ab. 1967: fitted with 308HP 2x6cyl 4sa oil engine by Scania Vabis, Södertälje. 1968: to Tehdaspuu Oy, Lappeenranta. 1995: to Kymmene Oy, Lappeenranta. 1995: owners name styled UPM Kymmene Oyj, Lappeenranta. 1997: new national reg. No 11 860. 17.1.2001: to Perkaus Oy, Lappeenranta. 6.12.1945: (Admiralty). Arrived Sheerness Dockyard and transferred to Superintendent Naval Stores Office for Fleet Fueling Service. 11.1958: (E. Mellenger, Montreal, Canada). 1961: Irving Fir (J.D. Irving Ltd., St. Johnís, Canada) (vessel converted to oil engine). Naval work to 1945: (Reported to have carried the name Beacon (Admiralty)). 11.2.1952: Transferred to Royal Navy Armament Depot, Upnor. 20.10.1958: Returned to Captain of Dockyard, Portsmouth (Port Auxiliary Service). M.O.W.T. Service. Naval work to 1948: (Admiralty). Captain of Dockyard, Portsmouth. 1961: Irving Pine (J.D. 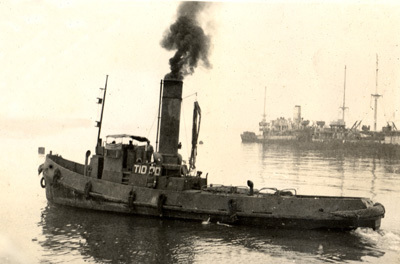 Irving Ltd., Canada) (Vessel converted to oil engine). 1947: Transferred to Royal Navy Mine Depot, Milford Haven. 1948: (F.T. Everard & Sons Ltd.). 1949: Renamed E.A. Everard (converted to oil engine). 1965: Withdrawn from service, engine removed. 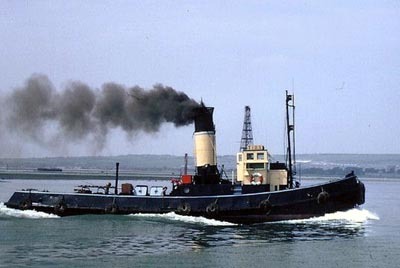 1971: Hull sold to L. Todd and scrapped Greenhithe, Kent. 5.1943: (War Dept. - Army). 12.1945: Sold (Government of France, Civil Port Admin, Le Havre). 10.1946: Sold to Government of Finland, (see TID 1). 1947, 14.1. to Yhtyneet Paperitehtaat Oy, Valkeakoski, dlv to Linnan Telakka Oy, Turku for repairs. 1947, 12.5. sale was cancelled due to the high costs and difficulties of the transport from Helsinki to Valkeakoski. 1947, 29.5. to Veitsiluoto Oy, Kemi. 1947, 30.8. sale was cancelled due to the draught of vessel (2.40 m). 1948, 19.10. contract with Linnan Telakka Oy, Turku, concerning repairs and a new deck house. 1950, 5.5. to F. W. Hollming Oy, Rauma (585), 1956 renamed NORPPA by owners. 1961, engines and boilers removed and an air compressor was fitted, after that the vessel was used as a floating air pressure station at the owner's shipyard at Rauma. 1984, to Kauko Korvala, Ii, motorized with an 500 HP 4sa oil engine made by General Motors Corporation, and a new deck house was fitted, with bridge and wheel house on top. 1985, entered service as KAKE, Ii (Oulu 4 -temporary register). 1991, to Ruoppaus ja Hinaus K. Korvala, Ii (Oulu 547), (reported built 1988 at Ii). New engines, 294 kW, 2xVolvo 100A. 1993, 1.11, new national reg. No 10 304. 1998, 3.1, to Lasse Sandgren, Harjumaa. 1998 as KAKE (Es), owned by Kake Korvala, Kunda. 9.1943: (Naval work - Mediterranean). 8.1946: Transferred to Government of Italy (Sea Transport Service, Sicily). Later renamed Gabbiano. Completed by C.D.Holmes of Hull, including installation of engine and boiler. 28.6.1943: Delivered to Hessle. 7.1946: Transferred to Government of Italy (Sea Transport Service, Sicily). Transferred to Admiralty from M.O.W.T. 6.1947: Renamed W. 91 (Civil Engineers, Malta). 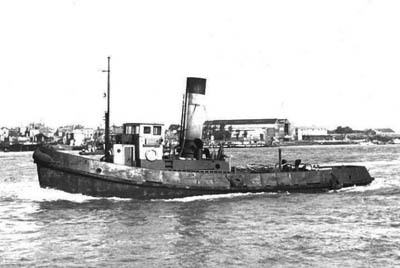 1948: Transferred to Civil Engineers, Malta, for towing hopper barges. 7.1943: (War Dept. - Army). 9.1962: Replaced by Tanac 83 from Malta. 16.4.1963: Sold to Captain W.J. Havens, c/o Australia House, London. 18.6.1963: Left Gibraltar towed by TID 56. 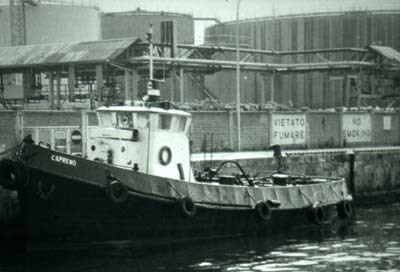 8.1963: Sabo (S. Bezzini & Son, Malta) (towed to Malta by TID 56) (converted to oil engine). 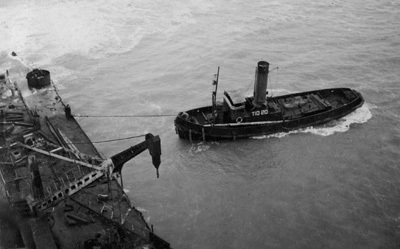 On 9 August 1943 the tugs TID 12 and TID 14 went aground at Tarlair Point, Macduff, Banffshire, after breaking adrift in heavy weather from the tugs Empire Larch and Onward when the towing bridle broke on delivery voyage from Hull to the Clyde, via Inverness. Attempts to reconnect the tow failed and both drifting tugs stranded. Held between rocks they were pounded by the weather, but then flooded by salvors to hold them in position. TID 12 lost her stern gear, TID 14 fractured her sternpost. Refloated three days later, they were towed to Macduff and were then 'in reserve' until December 1943 while under repair. In the same month they were transferred to the War Dept-Army and twelve months later TID 14 was in naval service for port duties and by April 1945 was being managed by the Dutch Government. During 1948 the vessel was reported as sold to them, and at the same time TID 12 was reported sold to Belgian buyers. (For details, see TID 12, above). Naval work to: 9.1944: (U.S. Army). 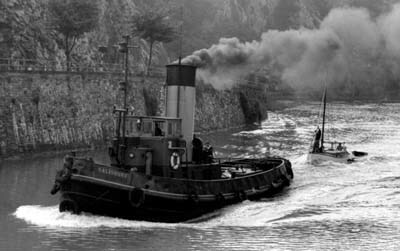 10.1945: (Chartered to Milford Haven Docks Co.). 1949: BP 2 (B. Perry & Sons, Bristol). 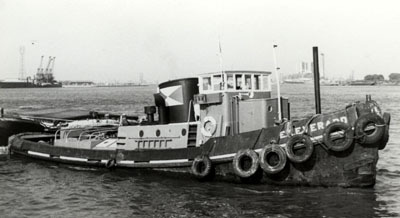 1964: (Converted to oil engine). 1980: (Laxey Towing Co., Isle of Man). 1946: Bonita (Liverpool Lighterage Co.). 8.1946: Sold (Sierra Leone Coaling Co.). 9.143: (War Dept. - Army). 9.1943: (War Dept. - Army). 1.1946: (Chartered to Westminster Dredging Co. Ltd.). 1947, 27.3. to Finnish Government, Helsinki (1 006), renamed B 12. 1950, 5.5. to F. W. Hollming Oy (Rauma), Helsinki. 1955, deleted from register "as scrap" according to her owners, never used as a steam tug. 1960, 11.4. builders certificate from F. W. Hollming Oy that their tug K 9 had been rebuilt 1959 60 and had been renamed KUUTTI. Fitted with an 8 cyl 4sa oil engine of 370 HP made by Motoren Werke Mannheim AG, Mannheim. 1975, owner's name styled Hollming Oy. 1983, 29.12. to Oy Eskoship Ab (Esko Saarinen), Helsinki (1 706), renamed TAPIO. 1988, 22.12. to Mäntyluodon Metalli Oy, Pori (522). 1992, owners went bankrupt, vessel sold. 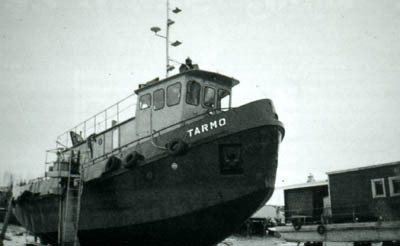 1992, 27.5. to Mäntyluoto Tug Service Oy, Pori. 1993, 1.11. new national reg. No 10 979. 1996, 2.12, to Marko Ervonmaa, Rauma, renamed MINOS. 12.1945: Sold to Government of France.